When we kicked off our first official year homeschooling a school-aged child, we chose to make July 1st our annual starting point. Having July 4th be our first focus means the first few days of school are packed with activities, crafts, and lighthearted pleasure while ensuring we hit some of the most important history our nation has, its founding. Holidays are a time for family and friends to congregate, and 4th of July is one of the more relaxed summer holidays. Who doesn’t love great weather and something yummy from the grill? Holidays with national significance are also a great opportunity for learning. It’s time to celebrate the red, white and blue with this 4th of July Headband. So get out the crayons, glitter and glue and get ready to celebrate our country’s birthday. Decorate your headband any way you wish before cutting it out and wearing it with pride. Enjoy this freebie from TeacherScrapBook. This is a one page writing activity geared towards celebrating the great 4th of July. 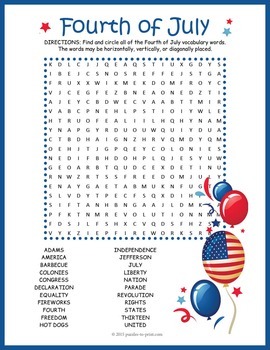 Choose any of the 4th of July themed words and use them to create a paragraph. Then, circle the words you used within the paragraph. Simple and fun for all grade levels! We love that Knowledge Box Central has a lapbook package that you can download. It covers the Declaration of Independence, important facts about Independence Day (more than BBQ! ), Patriotic Symbols and Memorials Activities, and US symbols like the Statue of Liberty in 289 pages. Perfect for helping littles learn about the history of our nation! Getting the kids excited for the 4th of July is easy while solving puzzles together! Featuring 22 vocabulary words, puzzlers will have to look in all directions to find the hidden words. I love that this notebook encourages personalized, independent research. Inspire long-term learning with the founding states, and discuss how the United States grew as a nation following the Declaration of Independence. Interest-fueled lessons help kids learn with greater depth and retention but creativity loves constraints and this notebook creates just the right framework. These adorable pages will let your littles’ inner artists shine while giving opportunity to talk about what’s in them. For example, what is the meaning of the Statue of Liberty? You can even talk about how she’s green because of copper oxidizing over time, and how pennies are made of the same material. Yes! Arts, History and Science all together! This is a tool that will resonate with auditory learners, and one that the whole family can enjoy. Learn the words of the Declaration of Independence through song, and hear them explained by a teacher in terms children can understand. I hold this truth to be self-evident: this CD is a great way to bring historical concepts to life for little learners.